Like all raw Pu-erh, this high quality tea buds was processed through kill green (sha qing), then dried in the sun - this arrests enzyme activity in the leaf allow the tea can be aged. Jiuwan offer this rare unopened tea buds in loose leaf to keep it in good appearance, you don't have to break cake or brick when steeped. A convenient to enjoy a excellent Pu-erh tea. 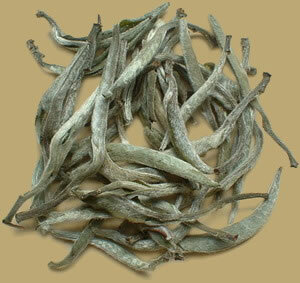 PREPARATION: To prepare Pu-erh Mao Cha, place about 3-5 grams of leaf per serving in a teapot. Rinse by covering with boiling water and quickly pour off. Fill with boiling water again and let steep 5-30 seconds (depending on how light or dark you want the tea) and serve. Pu-erh tea may be steeped 5-10 times.